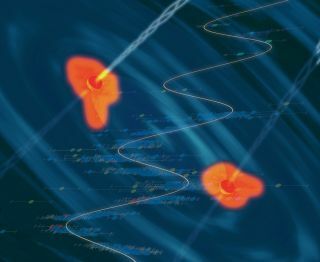 Artist's concept of a black hole binary inside a quasar, with the data showing the periodic variability superimposed. A mysterious light signal from a faraway galaxy could point to two supermassive black holes finishing up a merger in the galaxy's core, new research reveals. Scientists saw repeating pulses from a quasar — a bright galactic core powered by at least one huge black hole — and say the light is likely being generated during the latter stages of a monster black hole collision. The light signal from 3.5 billion light-years away was spotted by the Catalina Real-Time Transient Survey (CRTS), a set of three telescopes in Australia and the United States that look at 500 million light sources across 80 percent of the sky observable from Earth. "There has never been a data set on quasar variability that approaches this scope before," lead study author George Djorgovski, director of the Center for Data-Driven Discovery at the California Institute of Technology, said in a statement. "In the past, scientists who study the variability of quasars might only be able to follow some tens — or, at most, hundreds — of objects with a limited number of measurements," Djorgovski said in the statement. "In this case, we looked at a quarter-million quasars, and were able to gather a few hundred data points for each one." The discovery came as a surprise, as the researchers were originally trying to learn more about how quasar brightness varies. While scrutinizing the data, however, they found 20 quasars that varied predictably — unlike the chaotic signals that researchers are used to. Further analysis showed that one quasar, called PG 1302-102, likely has two black holes separated by just a few hundredths of a light-year. Other mergers observed previously placed such colliding black holes much further apart — anywhere between tens and thousands of light-years. To verify the signal, which appears to repeat every five years, researchers brought in historical information covering most of the last two decades. Also, the light spectrum revealed something interesting happening in the gases surrounding the disc, which are spinning so quickly that they get superheated. "When you look at the emission lines in a spectrum from an object, what you're really seeing is information about speed — whether something is moving toward you or away from you and how fast. It's the Doppler effect," said co-author Eilat Glikman, an assistant professor of physics at Middlebury College in Vermont. "With quasars, you typically have one emission line, and that line is a symmetric curve," Glikman added. "But with this quasar, it was necessary to add a second emission line with a slightly different speed than the first one in order to fit the data. That suggests something else, such as a second black hole, is perturbing this system." Researchers aren't sure what is causing the repeating light signal, but possibilities could include jets of material rotating around the center, similar to a lighthouse, or a distorted disc of material around the black holes that is either throwing material on the black holes or "blocking light from the quasar at regular intervals," Glikman said. The results of the research were reported Jan. 7 in the journal Nature.